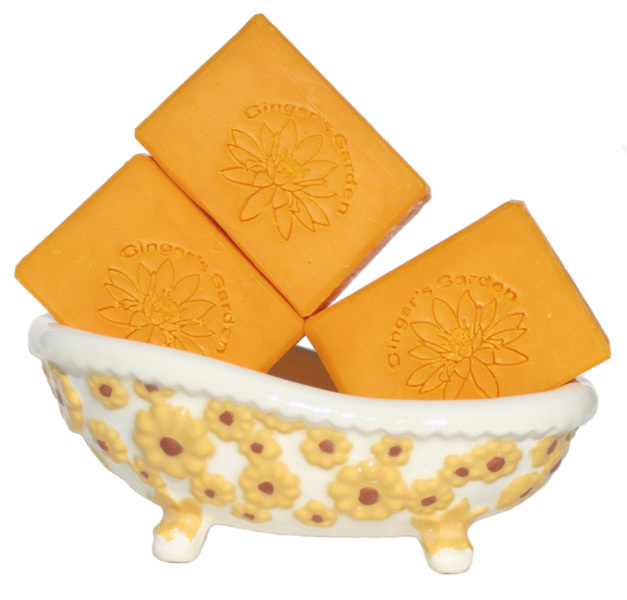 Carrot handmade, natural soap with vitamin rich carrot juice will make this mild gentle soap your favorite. No color or scent added. Buy this soap for your baby or if you have sensitive skin. Natural carrot soap is handmade from raw, organic carrot juice that's loaded with antioxidants, vitamin A and beta carotene. It comes by its pretty orange color naturally. It is unscented, fragrance free and gentle enough on any type of skin, whether sensitive, dry, oily, acne prone, normal skin or mature. Carrot handmade soap has creamy rich lather and lots of fluffy bubbles due to the natural sugars in the raw organic carrot juice. Ginger's Garden Handmade soaps are made with natural skin loving ingredients like pure olive oil, coconut, palm kernel, mango butter, castor oil and beeswax. This soap has no chemical or artificial ingredients added so it's safe enough for babies. Since this is a cold process soap, each bar is smooth and has beveled edges, making each bar easier to use. Everyone knows how wonderful carrots are for your body now imagine the beta carotene caressing your skin. Carrot handmade soap has been cured for well over 8 weeks to make sure that it’s gentle and mild. The water used during the soapmaking process has evaporated to make it a longer lasting bar. I made this soap formula to be used by anyone, including babies and children. It's nice for washing the face or enjoy this truly nourishing and moisturizing handmade organic soap in your bath or shower. Natural carrot juice soap is packaged in a soap box, so it can be used as a wonderful little gift for a birthday or a baby shower. It includes a full ingredient label. Handmade natural soaps retain all the goodness of glycerin to leave your skin silky. As with any handcrafted soap, it’s best to use a slotted or a draining soap dish and keep it out of water puddles so the bar lasts longer. Ingr: Raw Organic Carrot Juice, Olive oil, Coconut, Palm Kernel, Mango Butter, Castor oil, Soybean, Sodium Hydroxide, Beeswax. No added color or scent.